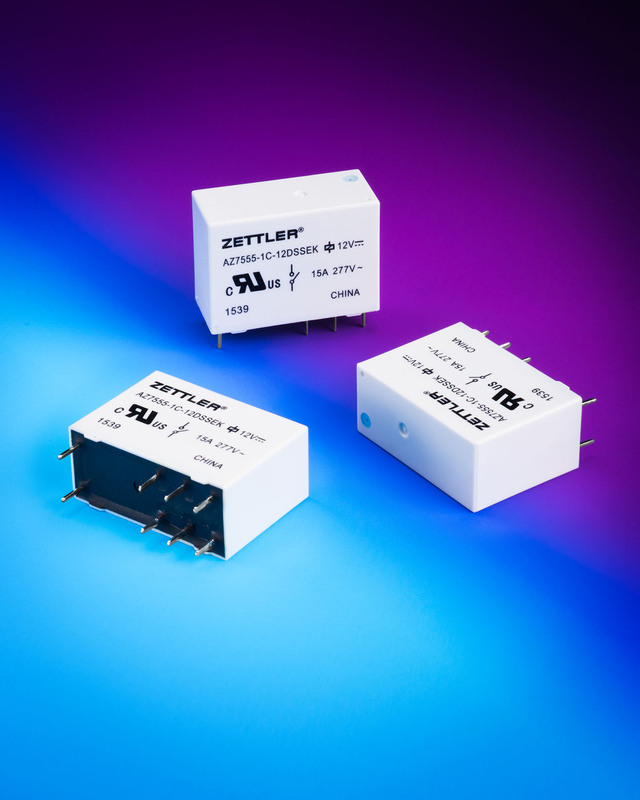 A new line of 15 to 20 Amp relays for appliance, energy management, motor control, and lighting applications is being introduced by American Zettler, the North American relay division of Zettler Group of Aliso Viejo, California. AZ7555 Power Relays consume one-sixth the energy of conventional 5 mm pin general purpose relays and cost 20 to 30% less than equivalent latching relays with superior functionality because they guarantee fail-on/off without additional circuitry. Featuring standard, sensitive, and super sensitive versions, the power consumption at pickup (typical) is 67.5 mW for the super sensitive version. Available with SPST (1 Form A) and SPDT (1 Form C) contacts, AZ7555 Power Relays have silver tin oxide contacts and are suitable for applications from 3 to 110 VDC with continuous power dissipation (max.) of 1.2 W @ 68°F, 0.9 W, and 0.2 W respectively. Dielectric strength is 5000 Vrms between coil and contact, plus the relays have 10 kV surge resistance. Class F insul-ation and epoxy sealing are offered. AZ7555 Power Relays are priced under $1.00 each at 10,000 quantities. Samples and price quotations are available upon request.